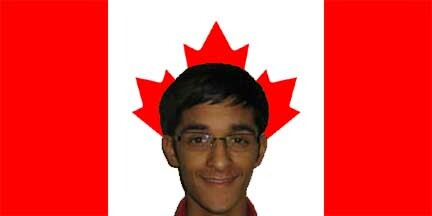 An essay by our son Nikhil while in Grade 5, four years after his arrival in Canada. As I stepped out of the airport, I got this feeling of wonder. I saw skyscrapers that had an elegance, which could never have existed in India. The streets were so much cleaner; I could have stared at them forever. The best improvement though was the air. It didn’t smell like free flowing sewage, no, it smelled like home. All these things I could never have imagined, because they simply didn’t exist in India. The drive to my mom’s house was long, and uncomfortable. I was excited to meet my mother after so long apart of course, but I was worried. I was worried how much she had changed, and I shuddered at the thought that I wouldn’t even recognise my own mother. As soon as I saw her, my worries melted like candle away. She kissed me, and hugged me so tight I thought my ribs would crack. She was still the same mom, and I was still her same son. I guess the important things never change, huh? My first day of school was a nightmare. The day started of with me mouthing the words to an anthem I hadn’t even heard before. I should have known that such a rocky start was a sign of things to come. I got a crash course in everything Canadian. I had to learn words like budding (in line) and yo. I had to learn how to do those annoying knock-knock jokes, which took me forever. The day was a lesson in American culture, and it was a painful one. Up until now, I hadn’t even thought about my radical transformation. Only now do I realise its aftermath. I had gained a flawless Canadian identity, but I had lost my Indian one along the way. I can’t even remember my home in India. I can’t speak the two Indian languages I once could. The worst consequence though is that I can’t interact with my cousins with the same familiarity anymore, it’s like there’s a wall between us. I had lost, no, I had killed my culture, and the sad part is, I didn’t even notice. Samajams & Churches made it worst.